Dimensions isn’t a name. 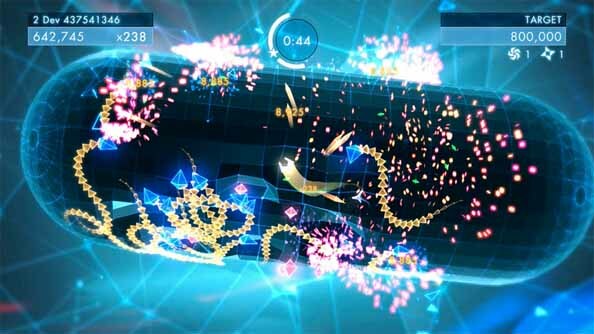 Oh, I mean it is the name of the surprise Geometry Wars sequel Activision announced at GamesCom – but it’s not just that. It represents a shift in the rules of the Liverpool-made rainbow score-chaser. Earlier this month, Activision resurrected Sierra as a publishing label for projects that didn’t fit their usual world-eating remit. They plan to partner with independent developers on games smaller than CoD and Skylanders – some of which will use of the Sierra adventure game licenses they have lying around. The first two games to be released on the label will be Lucid Games’ Geometry Wars 3 and a new King’s Quest from The Odd Gentlemen. Lucid are a Liverpool indie outfit founded by refugees from Bizarre Creations – the racing studio which first developed Geometry Wars as a Project Gotham minigame. 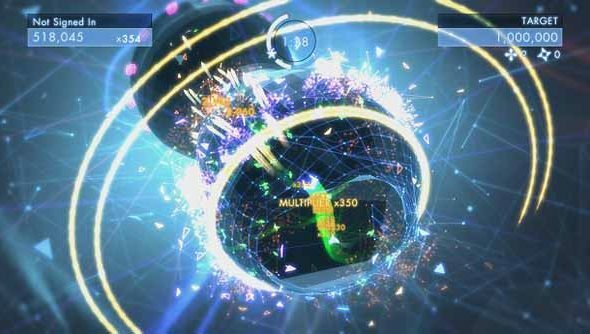 The last Geometry Wars was subtitled Galaxies and developed by Fire Warrior studio Kuju Entertainment for the Nintendo DS and Wii. It was quite good. Galaxies was greenlit by Sierra shortly before parent company Vivendi was absorbed by Activision. Sierra were shut down shortly thereafter, and Activision have since severed ties with Vivendi. But the rights to Sierra and its best-known games were left with Kotick and co.
And so, here we are. Are you happy to see Activision blow the dust from some of their most-neglected licenses?